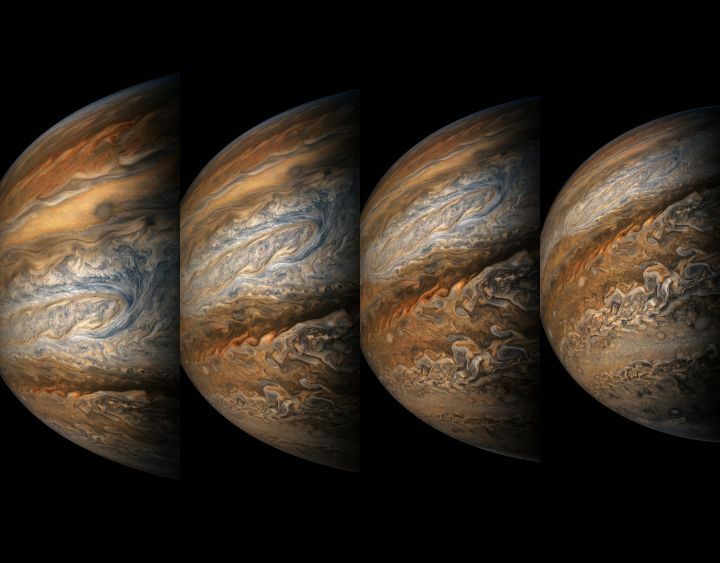 September 11, 2017 – This series of enhanced-color images shows Jupiter up close and personal, as NASA’s Juno spacecraft performed its seventh science pass (eighth flyby) of the gas giant planet. The images were obtained by JunoCam. From left to right, the sequence of images taken on September 1, 2017 from 4:03 p.m. to 4:11 p.m. MDT (6:03 p.m. to 6:11 p.m. EDT). At the times the images were taken, the spacecraft ranged from 7,545 to 14,234 miles (12,143 to 22,908 kilometers) from the tops of the clouds of the planet at a latitude range of -28.5406 to -44.4912 degrees. Points of Interest include “Dalmatian Zone/Eye of Odin,” “Dark Eye/STB Ghost East End,” “Coolest Place on Jupiter,” and “Renslow/Hurricane Rachel.” The final image in the series on the right shows Jupiter’s south pole coming into view. Juno launched on a United Launch Alliance Atlas V rocket on August 5, 2011, from Cape Canaveral, Florida, and arrived in orbit around Jupiter on July 4, 2016. During its mission of exploration, Juno soars low over the planet’s cloud tops — as close as about 2,100 miles (3,400 kilometers). During these flybys, Juno is probing beneath the obscuring cloud cover of Jupiter and studying its auroras to learn more about the planet’s origins, structure, atmosphere and magnetosphere. NASA’s Jet Propulsion Laboratory, Pasadena, California, manages the Juno mission for the principal investigator, Scott Bolton, of Southwest Research Institute in San Antonio. The Juno mission is part of the New Frontiers Program managed by NASA’s Marshall Space Flight Center in Huntsville, Alabama, for the Science Mission Directorate. Lockheed Martin Space Systems of Littleton, Colorado, built the spacecraft. Sierra Nevada Corporation and the University of Colorado Boulder also contribute to the mission. JPL is a division of Caltech in Pasadena, California.